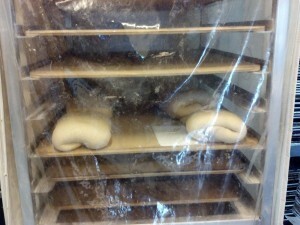 Last Sunday, I did my second bread workshop given by Sour Flour. 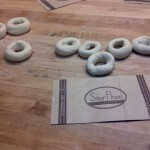 Sour Flour does what I call “breaducation,” teaching ordinary folks like me more about what’s going on in bread baking, and also training professional bakers. “Building community through bread,” says their website. 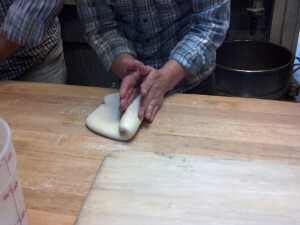 I love that idea: bread is more than just a food. We call it the staff of life. We look forward to the chance to break bread together. Our new discoveries are the best thing since sliced bread. And all we need is a loaf of bread, a jug of wine, and thou. Which is just another set of reasons that I love learning about bread, and sharing what I’ve learned with those of you who join in on The Science of Bread and Cheese Walking Tour. 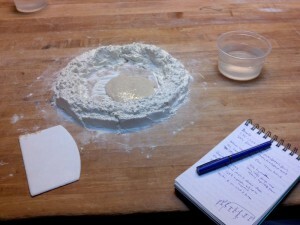 Start with the basics: flour, water, salt, starter. The flour is especially hight in protein, to make lots of nice, chewy gluten and lend that bagely bite. 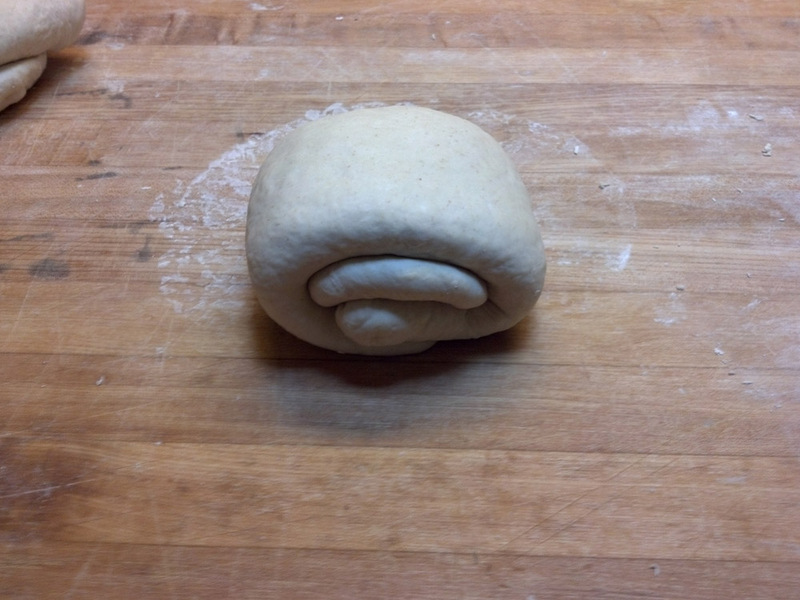 Mix it up, flatten it out. 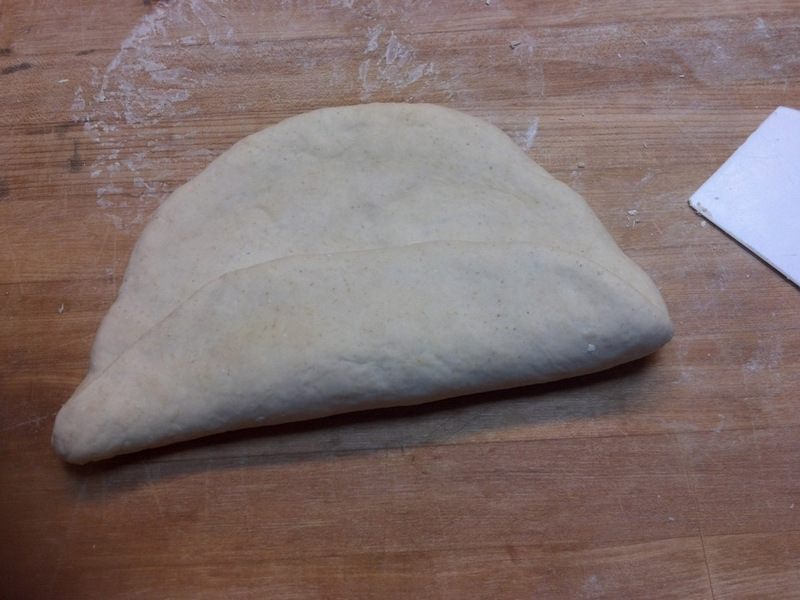 Then fold it up. 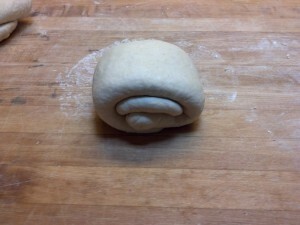 Do this a bunch of times to develop the gluten. With a softer piece of regular bread dough, Mike shows us how pliable and elastic the dough should be when the gluten is good. You can stretch it so thin you can see through it. Not with our bagel dough, though. Much too stiff. After enough rounds of flatten-and-fold, we set our dough aside for long rest before shaping it. 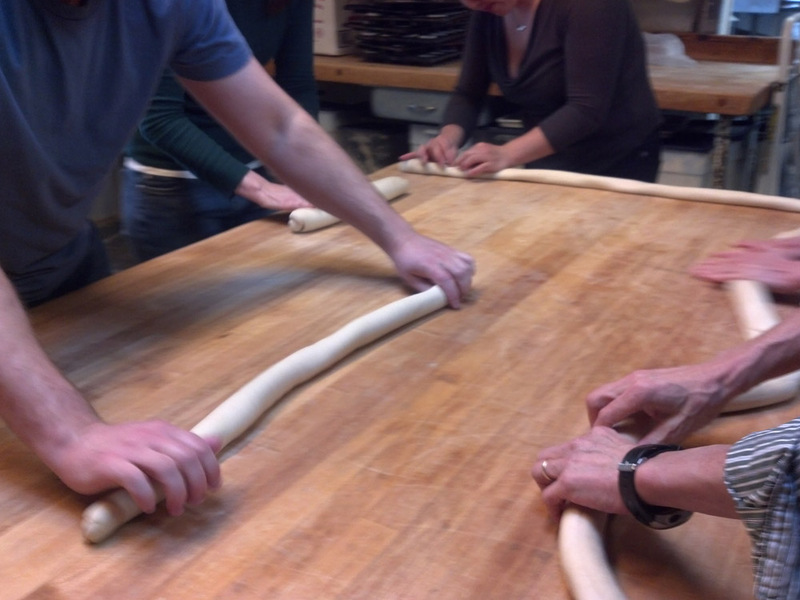 After the rest, we flatten it again, and tightly, tightly roll it up into a log shape. 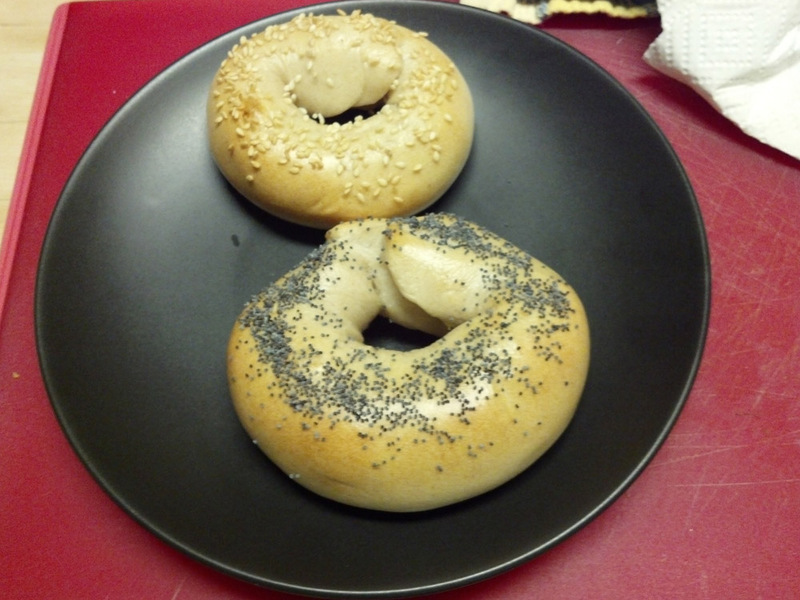 Then make a bagel snake. This was the hard part: how to close the loop, make a nice, even circle, and not have the seam show. Not surprisingly, our teacher Mike was much better at this than me. Bagel dough ready to transport home for baking! 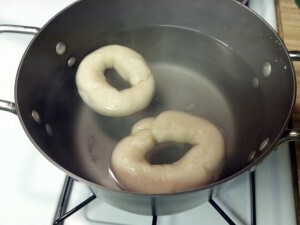 At home, drop them into boiling water till they rise to the surface. 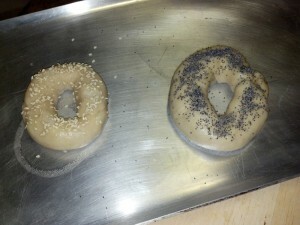 Add poppy and sesame seeds. 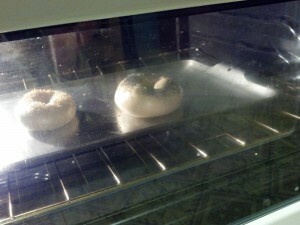 In the oven, they puff up and start looking like real, actual bagels! Ta da! 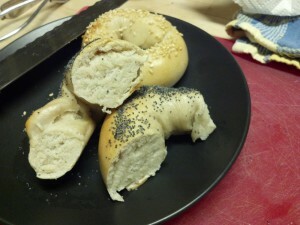 It seems sorta magical, not like baking regular bread. 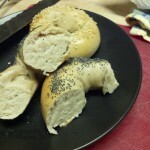 Dense and chewy inside. Fresh out of the oven, with butter. Mmmmm, wow. 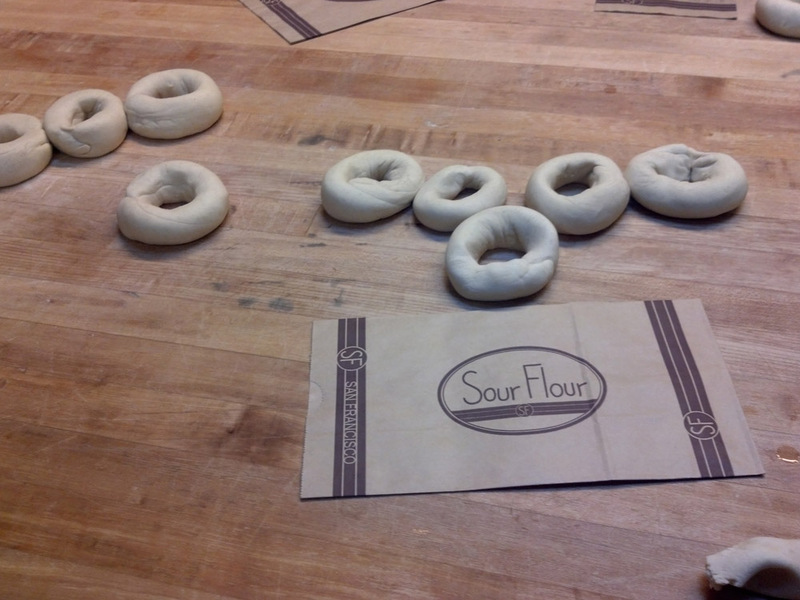 Bruegger's and Noah's got nothin' on Sour Flour! 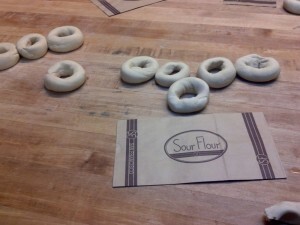 Sour Flour has three different bread workshops, one on starters, one on dough development, and this one about bagels. 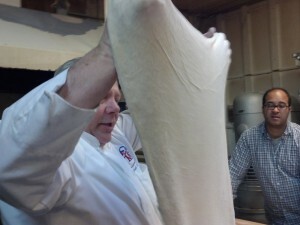 I learned a lot from the two I took, and went home with copious amounts of delicious bread dough! 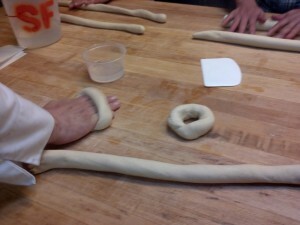 You can read about the workshops and sign up for them on the Sour Flour site.